The Death Star is one step closer to being fully operational and the Rebel Alliance must act quickly to counter this menace before the Empire tightens its grip on more star systems. 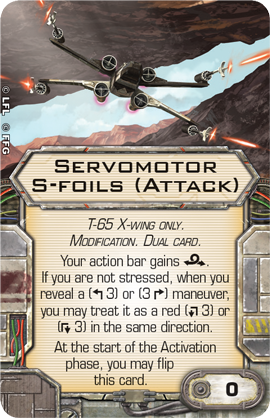 X-Wing™ Wave XIV—the Saw’s Renegades Expansion Pack and the TIE Reaper Expansion Pack—are available now from your local retailer or online through our website! These expansion packs take you back to the very beginning of the Galactic Civil War, putting you directly in the desperate struggle over the plans to the Death Star. On one side, you can join up with Saw Gerrera and his partisans to take whatever actions you deem necessary to stop the spread of Empire. On the other, you could patrol the skies over Scarif in a TIE reaper, giving even the most experienced Rebel pilots pause before entering the fray. No matter which side you choose, these expansion packs will help you usher in the next chapter of fast-paced space battles in the Star Wars galaxy with content from X-Wing Second Edition. Both the Saw’s Renegades Expansion Pack and the TIE Reaper Expansion Pack contain everything you need to convert their ships to second edition, giving you the opportunity to experience their raw power from launch. While other members of the Rebel Alliance debate their next move, Saw Gerrera takes action. He has been fighting tyranny across the galaxy since the Clone Wars and won’t stop until every trace of the Empire has been eliminated. Reflecting the rebel spirit of Saw and his band of freedom fighters, the Saw’s Renegades Expansion Pack puts a new spin on some classic Rebel ships. 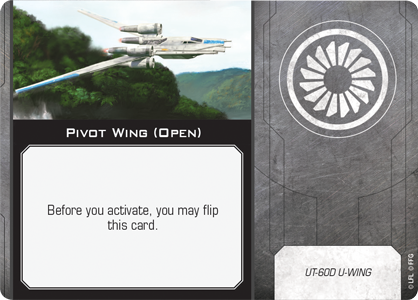 Both the T-65 X-wing and U-wing miniatures found here feature the striking black-and-white paint scheme particular to Saw and his freedom fighters and are accompanied by ten ship and fifteen upgrade cards that give them a distinct edge when compared to other Rebel starfighters. 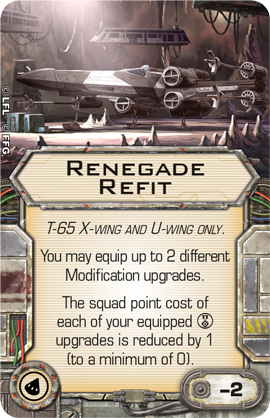 For example, you can now outfit your T-65 X-wing with the Renegade Refit upgrade included in this expansion. Filling the T-65’s torpedo upgrade slot, this upgrade gives you even more flexibility when customizing your ship and adding more ships to your squadron. The Renegade Refit gives you the room to equip two different Modifications, one of which could be the new Servomotor S-foils, granting you additional benefits depending on whether your s-foils are open or closed. What’s more, this upgrade has a negative squad point cost, giving you the freedom to further customize your other ships—or even squeeze in another T-65 X-wing. 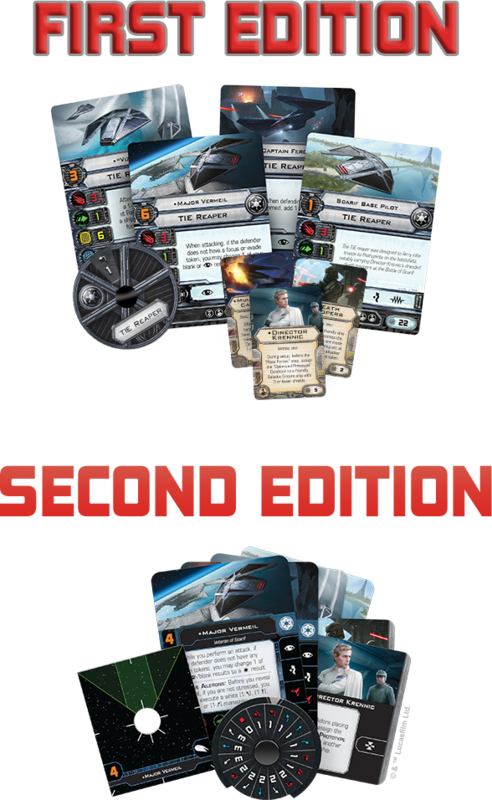 On top of this first edition content, you’ll also find ten ship cards and twelve upgrade cards along with all the maneuver dials, tokens, and bases you need to bring Saw and his partisans into X-Wing Second Edition. 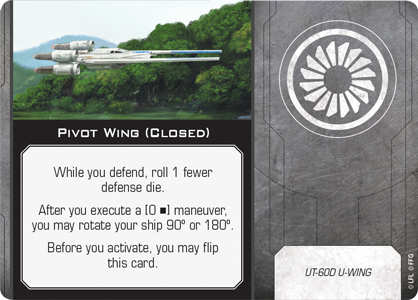 Among these, you’ll find an updated version of the U-wing’s Pivot Wing that gives you a greater degree of control over your ship's facing, potentially rotating in mid-air. 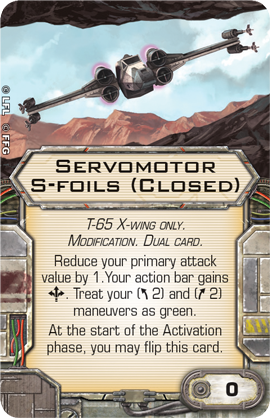 You can find a full preview of the Saw’s Renegades Expansion Pack here and a preview of the X-Wing Second Edition content found in this expansion here! The Death Star is a weapon of immeasurable power and the Empire will go to great lengths to keep the plans for this battle station out of Rebel hands. Among the security forces on Scarif, the TIE reaper is uniquely designed to strike fear in any Rebel forces who would dare mount an attack. Largely doing away with the speed and maneuverability that are the trademarks of so many Imperial starfighters, the TIE reaper makes use of a unique action bar and the ability to carry two crew members to keep enemy ships off guard. 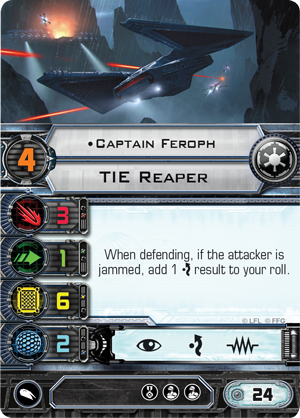 The four different ship cards and eleven upgrade cards you’ll find alongside the TIE reaper miniature in the TIE Reaper Expansion Pack enhance the ship’s ability to take the jam action, making the reaper wholly unique among Imperial starfighters. 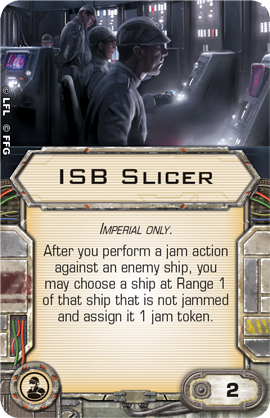 Captain Feroph, for example, gains a defensive bonus when the ship attacking her is jammed, an effect that can be spread to multiple ships if she adds an ISB Slicer to her crew. But the reaper can do much more than jam other ships. 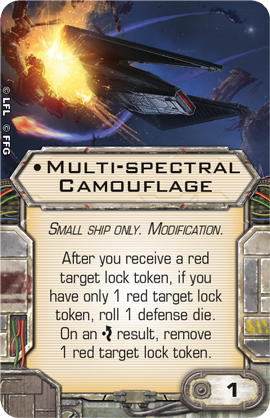 For a slow, heavy ship, it is surprisingly adept at avoiding enemy fire, especially if it’s equipped with Multi-Spectral Camouflage. This upgrade gives the reaper the rare ability to avoid target locks so long as it can roll an evade result, giving it an even greater chance of coming out the other side of a confrontation unscathed. The TIE Reaper Expansion Pack also contains X-Wing Second Edition versions of all four of its ship cards as well as ten upgrade cards that can be used to customize your TIE reaper or other ships. The reaper itself gets an upgrade in second edition, coming already equipped with Adaptive Ailerons that give the ship an extra burst of speed before you reveal its maneuver dial. 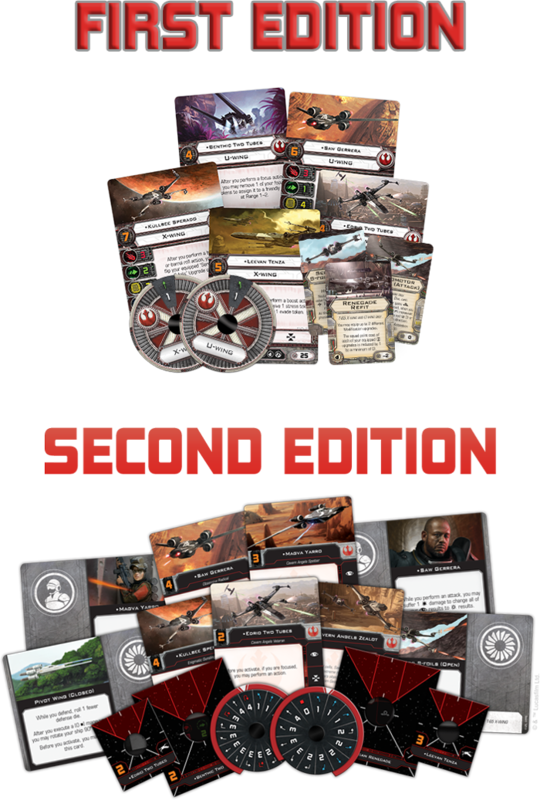 You can find a full preview of the TIE Reaper Expansion Pack here and a look at the X-Wing Second Edition content found in the expansion here! The events of Rogue One determined the fate of the galaxy and set the events of the entire Star Wars saga in motion. Now you can add three more ships from these pivotal battles to your X-Wing squadrons and get a glimpse into the future of space combat. Join the battle for the Death Star plans with the Saw’s Renegades Expansion Pack (SWX74) and the TIE Reaper Expansion Pack (SWX75), available now from your local retailer or our website!